Body-worn camera pilot: Program to be extended for six months under deal with BPPA. 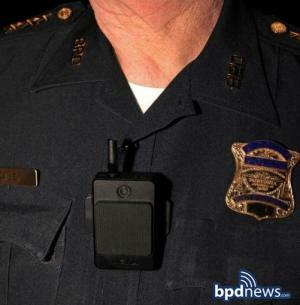 Mayor Martin Walsh and Boston’s largest police union have agreed to extend the city’s ongoing body camera pilot program for another six months. The mayor and Police Commissioner William Evans say that the program, which was due to expire this month, needs more time for the city to gather “sufficient data” to judge its effectiveness. The Boston Police Patrolmen’s Association (BPPA)— which initially opposed the program when it was rolled out last year— has decided to join the push for the six-month extension, though some advocates question the need for it. The initiative got off to a rocky start last year when, after a call by Evans for volunteers to wear he cameras, no officer stepped forward. The commissioner then ordered cameras to be deployed on 100 officers selected at random. Evans’s ruling was challenged in court by the BPPA, but a judge ruled that Evans had the authority to make the cameras mandatory. This agreement will mean that patrol officers currently equipped with body cameras will continue to participate in the pilot program, the mayor’s office said, with the pilot now scheduled to end on Sept. 11, 2017. “If necessary, replacement officers will be trained and assigned by the Boston Police Department,” the statement read. Segun Idowu, co-founder of BPCAT, told the Reporter on Monday that the group’s objection stands. “Extending this to get more data for a program you’re already calling successful doesn’t make much sense to us,” he said. While Boston touts its status as an innovative, progressive city, Idowu said delaying a full rollout will put the city considerably behind other municipalities committing to a comprehensive body camera program. He further asserted that the extension, which pushes the pilot completion to later in an election year, appears to be a “placating” move toward the police union. It is not yet clear how much the extension will cost the city. The Walsh administration budgeted $500,000 in the most recent budget to pay for the deployment, and some grant money has been provided for the pilot from the state’s Executive Office of Public Safety.